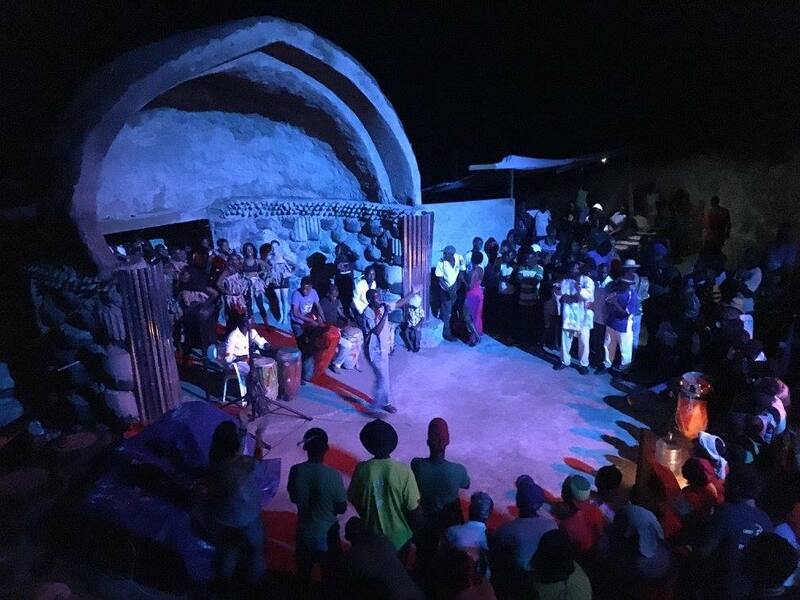 Sa-k-la-k-wel was co-founded through a year long process involving 4 Haitian and 3 foreign staff members as an Earthship style community center that would hold the triple purpose of an amphitheater for displays of art and music, space for classrooms, and self-sustainable water catching bathrooms. The building is also a demonstration example of self-sustainable AND hurricane resistant construction, much needed in a place like Haiti as it demonstrates construction techniques critical for the health and well-being of Haitians. In particular, these buildings are made primarily with re-used waste products of our society; tires, cans, bottles and cardboard are some of these materials. The form of the building is designed to resist the extreme winds from a hurricane. In addition, the building is designed to catch, treat and supply fresh water from the sky. 2014 – cleared the land, dug into the hill and began the tire work. 2015 – built the dome roof and finished building the theater, finished the walls to one of the classrooms, poured a very large floor and dug seating for 125 people. Twelve to twenty five people a day showed up to volunteer. Restarted Sa-k-la-k-wel’s tradition and host an annual celebration event. It was memorable. 2016 – finished digging two-thirds of the seating with the addition of one more row, built a protective double wall of tires, finished pounding the walls to the second classroom and packed out everything built. Also succeeded in holding the traditional annual music event! The 2017 hit took place from February 4th to March 10th and was led by Earthship Biotecture foreman Phil Basehart. One full classroom was finished, catching and recycling water. Thank you for helping us build an important venue and supporting a local Haitian movement that is working collectively to be sustainable and create access to fundamental knowledge and ethics.